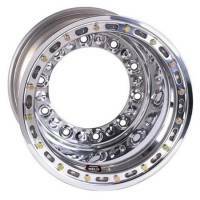 Weld Wide 5 HS Beadlock 15" x 12"
PitStopUSA.com - Weld Wide 5 HS Beadlock 15" x 12"
Weld Racing Wide-5 HS Beadlock 15" x 12" Wheel is solid and strong with its 0.190 heavy-duty rim halves and extra thick material throughout the entire wheel. The forged coined lug holes have two patterns to promote longevity and durability. This wheel is built to withstand the roughest race track surfaces. More About Weld Wide 5 HS Beadlock 15" x 12"
Weld Racing 15" x 12" aluminum wide 5 beadlock wheels are perfect for your dirt late model racing program. Weld continues to shave weight without compromising strength. Choose between our Bead-loc version or a roll forged lip wide 5 wheels. Don't forget to pick up your mud covers while you're shopping.